Vegetable Garden in a Pot or Raised Bed or the Ground? Some people are faced with a dilemma when planning their vegetable garden: should they plant their garden in the ground, or in raised beds, or even in pots? Each of these choices has advantages—and disadvantages. If you are blessed with a large, full-sun garden plot that has rich, well-draining soil, planting directly in the ground may be the easiest way to start your garden. However, if your garden site has compacted clay or very sandy or rocky soil, you can spend the time and effort to improve it by adding a lot of organic material. But you may want to consider a different option. A garden of raised beds. While creating a raised planting bed involves a considerable amount of work at the beginning, once it’s completed the ongoing work each season is minimized. You’re making your own custom planting medium, and along with it, an optimal growing environment for plant roots. If you enclose your raised beds with wooden sides—and a good choice for doing that are cedar boards at least 8 inches wide—it will be easier to keep your plot irrigated. Your planting medium will also likely be free of existing weed seeds that are often found in garden soil. And, because the garden is raised slightly, weeding involves a little less bending—you can often do it while sitting on the edge of the bed. What’s more, root vegetables such as carrots, turnips, and parsnips appreciate the extra depth and loose soil afforded by a raised bed. Raised beds aren’t entirely trouble free. They have to be weeded and watered like any other garden, and the great results you obtain early on won’t continue year after year unless you regularly amend the soil with additional compost. 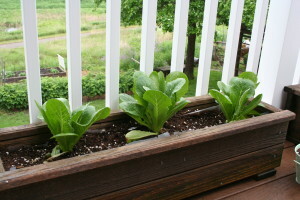 But overall, if you have the space and the sun for them, raised beds are often the way to go. But what if you don’t have enough room for a raised bed, or less than full sun? The solution for you might be an easy one: grow vegetables in pots. While we’re used to seeing herbs growing in containers, and the potted patio tomato is a familiar favorite of many, it’s surprising how many other vegetables you can successfully grow in containers. I’ve grown peppers, lettuces, Swiss chard and bush variety cucumbers, beans and zucchini in pots. I’ve known others who have used containers to grow eggplant, kale, and even potatoes. In theory, you should be able to grow just about anything in pots, but they aren’t that practical for root vegetables or trailing and vining plants like peas, pole beans, or watermelon. One advantage of growing in pots is that with limited space, you can put your garden right where it will receive the maximum sun exposure. Some people I know even put their vegetable pots on casters so they can roll them around to catch the sun as it moves across their garden. Container gardens are easy to keep weed-free, and if you use a good planting mix your results with many varieties should equal a raised bed. However, container plants dry out much faster, thus requiring greater watering vigilance. Uneven irrigation can lead to other problems, such as blossom end rot in tomatoes. Also, the soil in containers tends to lose nutrients that wash out during the growing season, so additional fertilizer is needed. Finally, at the end of the year, the soil in pots is pretty much spent, so that means starting from scratch when you set out to create next year’s garden. Follow Notes from Northern Gardener throughout January as we offer our series on 31 Days to a Great Northern Vegetable Garden. Tomorrow: What to Grow in Your Vegetable Garden.